Filled with factories and warehouses south of downtown L.A., the 5.2-square-mile city of Vernon (population: about 240) was settled long ago by farmers. So you could say that Local Roots Farms is bridging the town’s agrarian past with its industrialized present. 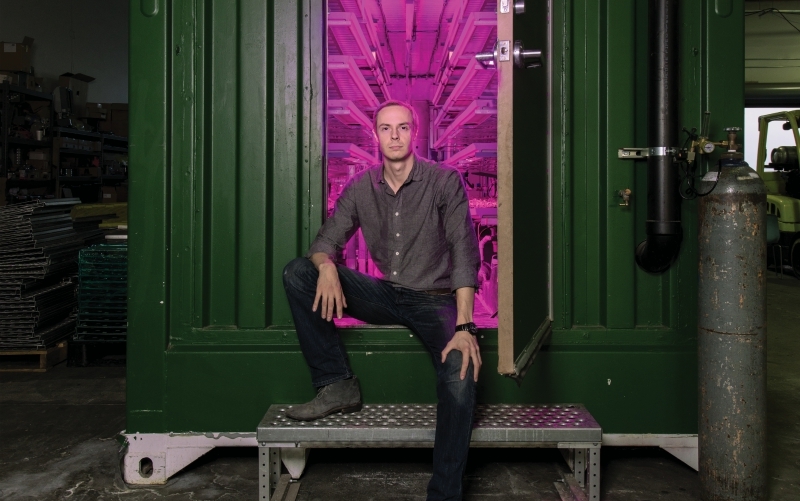 The five-year-old company is focused on growing premium salad greens in an icon of the industrial world: shipping containers. Eric Ellestad, the company’s slim 30-year-old CEO, calls them TerraFarms. With LED lighting, computer-controlled sensors and cameras that monitor plant health, and shelves of hydroponically grown plants, a 40-foot container can yield 4,000 heads of lettuce every ten days. The greens are priced competitively with nonorganic fare, yet the process uses 97 percent less water than a conventional farm and no pesticides or herbicides, since bugs and weeds are less likely to get in. In fact, Ellestad likes to say his produce is actually “better than organic,” noting that certified organic growers can still use non-synthetic pesticides. This might not convince consumers who assume “organic” means back-to-the-land naturalness, but less polemical is the precision that comes with indoor farming. COO Matt Vail, a bearded biomedical engineer, points to the role of the “light recipe” the company uses. “By adjusting the blue light that we give a plant early on in its life cycle, we can actually change the color of the plant,” he says. “Imagine kale that would [normally] grow green, but by increasing the blue light, we can grow that kale red.” Red kale? “The red is beautiful—it really pops,” says Vail. The company can also tweak flavor and nutrient profiles. At its core, though, Local Roots is about being able to grow food in even the most urbanized space because that’s where the customers are. The shipping containers are what help set it apart from other indoor operations: You can pop the metal box into a parking lot or the corner of a warehouse and expand incrementally. The idea is to eventually be able to produce local, farm-fresh produce in wintry Boston or the Sahara Desert. So the company is ramping up production by retrofitting 100 shipping containers as TerraFarms on the site of a massive old dumpster factory two blocks away. There are plans to add 150 more people to its staff of 46, but Ellestad is also thinking about how to remove humans from the production process. After all, the uniform stacks of lettuce seem well suited for automated farmhands. “Imagine a lawn mower that’s filling a conveyor belt that’s filling a bag,” he says. Robots seem kind of fitting for a postindustrial industrial farm, but one thing they’ll never be able to do: savor a good vinaigrette on those greens.